1. the guy on the far left (black suit) looks like Abe Lincoln, but I think it’s just the grounds crew guy from Vero Beach that’s been with the team for like 50 years. 2. A very short Abe Lincoln. I think that’s Billy DeLury one of the team’s traveling secretaries. 3. The verdict on Lugo: Not Guilty. 4. 1 : Great, hilarious observation. My question with that picture is where was Tommy Lasorda that day? It seems odd that the guy with Dodger-blue blood blew off picture day. There are recent comments on old posts for Darrel Evans, Bob Welch, and Vic Harris, plus Ramblin’ Pete ties a caustic bow on the Billy Martin “innermost wish” conversation. And speaking of Ramblin’ Pete, his ongoing Red Sox-loss-equals-Billy-Joel-song performance piece on my answering machine yesterday yielded up “Always a Woman.” I am braced for today’s entry, slightly soothed by the fact that there will be no Billy Joel songs tomorrow, for the Red Sox have the day off today and for once can’t lose. 5. 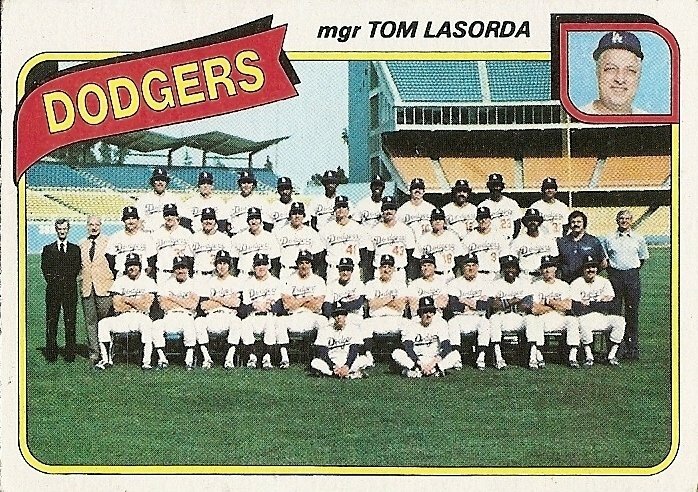 4 It is hard to tell (even checking my own 1980 Dodgers team card), but I’m pretty sure that’s Lasorda in the front row, arms crossed, between the two bat boys. The 1980 team cards all have insert head shots of the manager, it doesn’t mean they missed the photo shoot. Meanwhile, do tell about this Billy Joel-themed soundtrack to the AL East race, I’m very curious. 6. I think it is payback for getting so much out of a bloody stolen base. We knew then there would a price to pay, but only now do we know how much of a price. You are in select company of being a Boston/Dodger fan. My brother salutes you. I was once part of the small fraternity but it died with the WS victory, and now my AL attachment is for the downtrodden DevilRays who will soon be beating the Beantown Boys with a payroll that Donald Sterling would be proud of. When JD left for Boston I said his game wouldn’t cut it there and that Boras did him a disservice. I guess I just like being right once in a while. I hate the Yankee’s but I love watching JD flail, Lugo struggle, and Gagne implode. 7. 3 : That’s a nice story about Lugo giving a ball to your daughter, Ken. Now I feel bad about wanting to pelt him with food last night. It’s possible he so badly wanted to come through with the big hit last night that when he didn’t he had a moment of motionless self-laceration that caused him to be late to first. That’s not great or anything, but at least it’s better than not even caring. 9. As for whom to blame, I’m stuck between the Freemasons and the rain. 10. That must be Lasorda between the bat boys. I can’t imagine anyone else inconsiderately splaying his legs that wide. I do have a t-shirt with the team photo of the 1966 Packers that includes several coaches and trainers, but not Lombardi. These seem to be the only settings on the celestial appliance governing the Red Sox’ recent gyrations. 12. 11 The upside is he can’t sing “The Longest Time” to you anymore. 15. During the recent Giants-Dodgers series in S.F., the Giants TV crew did a search for the best anti-Dodgers shirt, and some fan was wearing a black shirt with orange lettering that stated “I STILL HATE STEVE GARVEY”. Steve Garvey is to blame. 17. 14 Not surprising. Some people claim that there’s a woman to blame. But Josh, it sounds like its your own damn fault – for not heeding your vow of two nights ago. Me, I blame Joseph Lochner and Rufus Peckham. 18. well, if Ozzy or Judas Priest is not to be blamed, why not just blame…Karim Garcia?! 19. Personally, I blame Howard Jones. 20. In all fairness, the Dodgers also sent Kevin Brown to the Yankees in 2004, and he certainly had a memorable outing in game 7. Nomar – Why’d you need a shortstop in the first place? JD Drew is all on Theo Epstein. The dude went 2 months without a homer last year and needed a phenomenal month in September to get 20 HR. He was also part of the play. As for Gagne, he’s got a BABIP of like a trillion. He’s pitched like 10 innings. Small friggin sample size. So blame that on Henri Stanley. 24. 20 : Much as I’d love to have Hanley Ramirez, I’m not sure you can call that trade a terrible deal. Beckett’s been great this year, and the Red Sox would be nowhere this year without Lowell, who was also in that deal. I just wish they’d have kept Orlando Cabrera. Meanwhile, as I write this the “Red Sox player” pictured in the September page of my Red Sox calendar, Alex Gonzalez, stares down at me. 22 : What a pair! 26. 24 – I wasn’t calling it a terrible trade so much as an explanation for why you have Julio Lugo. The Jeff Suppan trade is another story. 27. 24 I never understood why the team calendars put the marginal players later in the year, when they’re the ones least likely to still be with the team when those months come around. It’s not a record, you don’t have to front load it with the hits. 28. Cliffy, nobody makes records anymore, except Barry Bonds, and his are chock full of asterisks. 29. 26 : I hear you. I actually didn’t mean to imply you had made that claim–the “you” I used was meant to be more of a royal you, or whatever. It’s amazing how many decent to very good shortstops have cycled through Boston in recent years (they had Eckstein in the minors, too), and they end up with perhaps the least effective of the bunch (I don’t have the stats/analytical capability/patience to compare Lugo’s combo of subpar offense and mediocre fielding to Alex Gonzalez’s combo of putrid offense and excellent fielding). 1. Small sample size. Find me a sample, however small, from 02 to 04 where he was this bad. 2. Can’t handle east coast pressure, Boston NY pennant race, adjustment to non-closer role, etc etc. Dollars to donuts the dumb Canadian is pitching hurt. Again. And to answer the nagging question, well, Nomar did kind of mess up the Dodgers’ season in a lot of ways. There you go. I just made the Juan Pierre signing look really good in a completely unrelated post, though I think it contains relevant information. Red Sox are still in first place in their division and still 7.5 games away from being ousted from the playoffs. The season isn’t nearly over for them yet. The Dodgers, whom you are tempted to blame, are now 7 games behind away from a playoff spot, and would have to pass five teams to do it. Instead, I blame the entire Eastern Seaboard. 33. This is setting up well for a playoff repeat. Lugo’s lack of hustle makes him the ideal candidate to get thrown out going from second to home on a double. And Drew will inexplicably follow him to be the second player out at home on the same play. 34. I think Buchholz represents Youth, and the Lugo/ Drew tandem are ‘the loss of innocence’. I blame God. F U God. 35. I take it back, God. Heh eh. I take responsibility. This whole thing has affected my personal relations and self-esteem (fear). I reckon I’ll just have to go through the FEEEEEEELINGS. 36. 32 : Accepting faulty logic? Me? How dare you, sir! Yes, clearly my paper-thin premise is looking flimsier with each passing moment, and now I fear that I have, if anything, added, with my ill-fated and short-lived “blame the Dodgers” campaign, to the bad karma of the 1916 World Series win, the fraudulent Jackie Robinson tryout, and the general myopic east coast bias that does indeed often reduce baseball to a (humorless) sports version of that famous New Yorker cover that dwarfs all land beyond the Hudson river into a narrow, inconsequential strip (http://www.magazine.org/Editorial/40-40-covers/4.jpg). So let me now apologize to Reggie Smith, Lee Lacy, Ron Cey, all of those fine sun-drenched fellows, even Steve Garvey, that handsome, irrepresible, thick-forearmed douche. The Dodgers are not to blame! They were a damn fine team when I was a lad, possessing everything a team needs: good pitching, good fielding, power, speed, an outlandishly obscene manager. I should have taken this opportunity to praise their virtues, including those of the fine hitter and fielder Garvey, whose presence caused the Dodgers to jettison Bill Buckner, who went to the Cubs, who in turn after some years then traded him to the Red Sox, where he ended his long and illustrious career gently and nobly, without incident save for the long ovations offered him by the grateful home fans. Sorry and good luck, Dodgers. I mean it! And if the Jays crap the bed vs the Yanks (especially Dustin “I threw 122 pitches in my last start” McGowan and AJ “I threw 124 pitches in my last start” Burnett), it will be doubly true. If not, back to trying to answer the question. I’ve got to check this place out more often. Your writing is incredible, Josh. 40. Josh, you’re right — it’s the Dodgers fault. Don’t let anyone try to tell you anything different. It’s much worse than many people believe. They have stuck it to the East Coast since moving from Brooklyn in the 1950s. Consider what followed in New York — city bankruptcy, the great blackout, Steinbrenner buying the Yankees from CBS, Ed Koch — all the Dodgers fault. But this wasn’t enough as then they had to move on to set their sights on Philadelphia in the 1970s. Steve Garvey, Ron Cey, Bill Russell, et al. combined to create chaos in my hometown which we have yet to shake. They totally ruined what should have been a happy childhood. Now I am a 40 year old cynic just waiting for another Phillies collapse. Curse you Walter Alston for stealing my joy! Josh, as you are now learning the Dodgers just are not happy with their past destruction. Now they have set their sights on Boston and seek to rob the joy of your only recent World Series victory (do you not see the parallels with Philadelphia here?). Now is the time to purge Boston of all vestiges of Dodger Blue. Trust me you can live without JD Drew (we still boo him in Philadelphia — we see right through him for what he really is). Gagne? Hell we’ve got Joe Table (Jose Mesa) pitching down the stretch so surely you can find someone (Bob Wickman anyone?) without the taint of the Dodger Blue. You can keep one of your Dodger Blues (which is why the Phillies are not tainted by Jayson Werth) — they’re only dangerous in groups. Conspiracies only work with two or more people and this is one of the highest order. It makes the Cold War look like a walk in the park. Do not be deceived — it is indeed the Dodger’s fault. It’s time for the collective baseball world to wake up to this threat and take action before it is too late. And let’s take time to thank the Rockies for the public service they have done by helping to finally bury this year’s team and rid the world of this threat. 41. We all wish (ex-Dodger) Willie Randolph was to blame but the guilty one is David Wright. Jesus Christ, David. 42. 39 : Hey Will, I forget if I’ve asked you this before, but how do you get your game info in that yonder land of tsingtao beer? Ever a chance to watch a game? 40 : John, I’ve been thinking a little about the Phillies of late (see below). 41 : Mets fan Ramblin’ Pete called me last night in a mood much, much darker than the one he’d been in earlier in the day when warbling “Just the Way You Are” into my answering machine. I am planning to repay his recent practice of marking Red Sox losses with answering machine renditions of songs by annoying ’70s-’80s hitmaker and Yankee fan Billy Joel by marking Mets losses with answering machine renditions of songs by annoying ’70s-’80s hitmakers and native Philadelphians Hall and Oates. 44. Actually, I’ve give this a lot of thought now. It is clearly, without a doubt, the Yankees fault. 45. I blame Jeff Kent. For everything. 47. I still have that 1980 Dodgers team card. It was one of the few team cards I saved for some reason, even while saving most of my other baseball cards. It was always easy to pick out Davey Lopes and Vic Davallilo on those cards. Man, as if we didn’t have enough to feel sad about, now Dodger fans have to feel some sort of guilt for the Red Sox coming down to earth? Feh! Feh I say! Yeah we gave you Dave Roberts for a song the World Series year, and then the ex-Dodger guys they got this year – um, is it such a huge shock that those guys are negative influences on a team, and that Gagne isn’t close to 100% or his former self? Feh! You can have Shea Hillenbrand and Luis Gonzalez next year if you’d like. 48. josh, i mostly get it from Baseball Thoughts. i read Jon’s posts, occasional comments and usually check the game link. I rarely look elsewhere…. it’s pretty difficult to get english language programming on TV here so i don’t watch anything but DVD’s. I suppose i could get the MLB Live thing but don’t like watching TV on the computer and my connection isn’t real fast anyway. so that’s it….just baseball toaster and the occasional foray onto the CNN/SI website. i was back in the States in august and took my kids to an Orioles game. that’s the last game, and probably the only game, i’ve watched this year. but i’ve heard that the Dodgers and maybe one or two other teams might come over in March for spring training (to Beijing). I would definitely fly over for that (only about an hour away). I caught the Dodgers about a dozen years ago when they made a trip to Taiwan and played a few games. 49. (17) I agree with thelarmis that we should blame Karim Garica. I haven’t written on my husband’s site yet, but when I read this one I absolutely had to. I blame Karim “douche bag” Garcia for everything; for my bad habits, for global warming, for the national deficit, for the war, you name it, it’s his fault. Don’t come to the Yankees (yes, our Red Sox fanatic married a Yankee fan) and try to take Tino Martinez’s place, oh wait, that was Jason Giambi, oh well, I hate him to. Sometimes I mix up all these thick-necked, giant pored, oversized nostriled dudes.